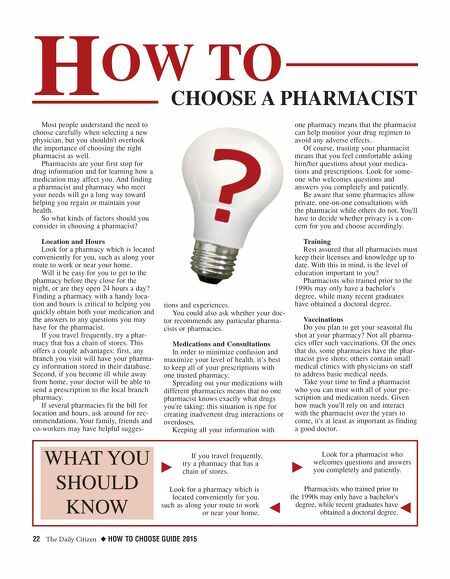 22 The Daily Citizen ◆ HOW TO CHOOSE GUIDE 2015 Most people understand the need to choose carefully when selecting a new physician, but you shouldn't overlook the importance of choosing the right pharmacist as well. Pharmacists are your first stop for drug information and for learning how a medication may affect you. And finding a pharmacist and pharmacy who meet your needs will go a long way toward helping you regain or maintain your health. So what kinds of factors should you consider in choosing a pharmacist? Location and Hours Look for a pharmacy which is located conveniently for you, such as along your route to work or near your home. Will it be easy for you to get to the pharmacy before they close for the night, or are they open 24 hours a day? Finding a pharmacy with a handy loca- tion and hours is critical to helping you quickly obtain both your medication and the answers to any questions you may have for the pharmacist. If you travel frequently, try a phar- macy that has a chain of stores. This offers a couple advantages: first, any branch you visit will have your pharma- cy information stored in their database. Second, if you become ill while away from home, your doctor will be able to send a prescription to the local branch pharmacy. 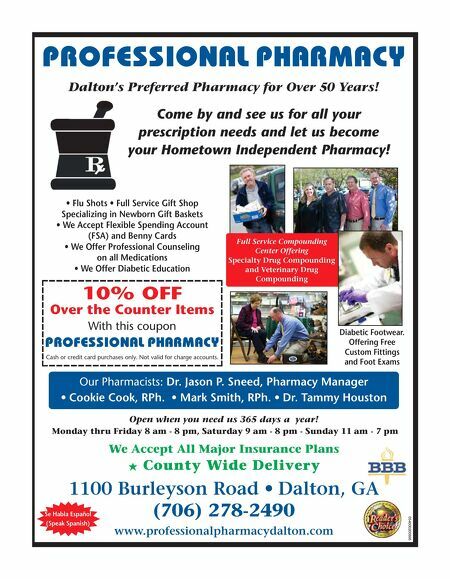 If several pharmacies fit the bill for location and hours, ask around for rec- ommendations. Your family, friends and co-workers may have helpful sugges- tions and experiences. You could also ask whether your doc- tor recommends any particular pharma- cists or pharmacies. Medications and Consultations In order to minimize confusion and maximize your level of health, it's best to keep all of your prescriptions with one trusted pharmacy. Spreading out your medications with different pharmacies means that no one pharmacist knows exactly what drugs you're taking; this situation is ripe for creating inadvertent drug interactions or overdoses. Keeping all your information with one pharmacy means that the pharmacist can help monitor your drug regimen to avoid any adverse effects. Of course, trusting your pharmacist means that you feel comfortable asking him/her questions about your medica- tions and prescriptions. Look for some- one who welcomes questions and answers you completely and patiently. Be aware that some pharmacies allow private, one-on-one consultations with the pharmacist while others do not. You'll have to decide whether privacy is a con- cern for you and choose accordingly. Training Rest assured that all pharmacists must keep their licenses and knowledge up to date. With this in mind, is the level of education important to you? Pharmacists who trained prior to the 1990s may only have a bachelor's degree, while many recent graduates have obtained a doctoral degree. Vaccinations Do you plan to get your seasonal flu shot at your pharmacy? Not all pharma- cies offer such vaccinations. Of the ones that do, some pharmacies have the phar- macist give shots; others contain small medical clinics with physicians on staff to address basic medical needs. Take your time to find a pharmacist who you can trust with all of your pre- scription and medication needs. Given how much you'll rely on and interact with the pharmacist over the years to come, it's at least as important as finding a good doctor. H OW TO CHOOSE A PHARMACIST WHAT YOU SHOULD KNOW k j If you travel frequently, try a pharmacy that has a chain of stores. Look for a pharmacy which is located conveniently for you, such as along your route to work or near your home. k j Look for a pharmacist who welcomes questions and answers you completely and patiently. Pharmacists who trained prior to the 1990s may only have a bachelor's degree, while recent graduates have obtained a doctoral degree.